I wrote a rather favorable column a few days ago about a new study from economists at the Organization for Economic Cooperation and Development. Their research showed how larger levels of government spending are associated with weaker economic performance, and the results were worth sharing even though the study’s methodology almost certainly led to numbers that understated the case against big government. Regardless, saying anything positive about research from the OECD was an unusual experience since I’m normally writing critical articles about the statist agenda of the international bureaucracy’s political appointees. That being said, I feel on more familiar ground today since I’m going to write something negative about the antics of the Paris-based bureaucracy. The OECD just published Revenue Statistics in Asian Countries, which covers Indonesia, Singapore, Malaysia, South Korea, Japan, and the Philippines for the 1990-2014 period. Much of the data is useful and interesting, but some of the analysis is utterly bizarre and preposterous, starting with the completely unsubstantiated assertion that there’s a need for more tax revenue in the region. …the need to mobilise government revenue in developing countries to fund public goods and services is increasing. …In the Philippines and Indonesia, the governments are endeavoring to strengthen their tax revenues and have established tax-to-GDP targets. The Philippines aims to increase their tax-to-GDP ratio to 17% (excluding Social Security contributions) by 2016…and Indonesia aims to reach the same level by 2019. Needless to say, there’s not even an iota of evidence in the report to justify the assertion that there’s a need for more tax revenue. Not a shred of data to suggest that higher taxes would lead to more economic development or more public goods. The OECD simply makes a claim and offers no backup or support. But here’s the most amazing part. The OECD report argues that a nation isn’t developed unless taxes consume at least 25 percent of GDP. These targets will contribute to increasing financial capacity toward the minimum tax-to-GDP ratio of 25% deemed essential to become a developed country. This is a jaw-dropping assertion in part because most of the world’s rich nations became prosperous back in the 1800s and early 1900s when government spending consumed only about 10 percent of economic output. And not only were taxes a concomitantly minor burden during that period, but many nations didn’t have any income taxes at all. At this point, you may be thinking the OECD bureaucrats are merely guilty of not knowing history. That certainly would be a charitable explanation of their gross oversight/mistake. But there’s something else in the study that makes this benign interpretation implausible. The study explicitly notes that Singapore is a super-prosperous developed nation with a very low tax burden – way below the supposed minimum requirement identified by the OECD. Singapore has the highest GDP per-capita of the six countries and one of the lowest tax-to-GDP ratios. 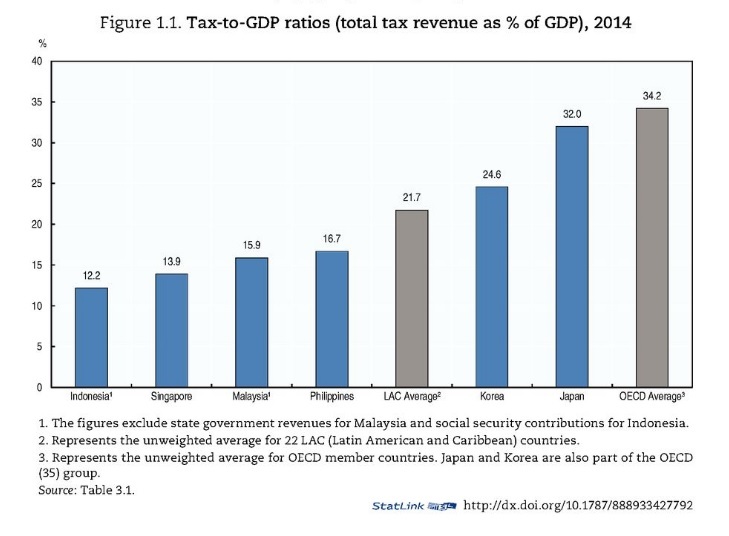 …The low tax-to-GDP ratio is explained by lower income tax rates (particularly on corporate income) and VAT rates, compared to other Asian countries. …The tax-to-GDP ratio in Singapore is lower in 2014 relative to 2000, driven by the decrease of individual income tax rates and corporate income tax rates. Here’s a chart from the report showing that taxes consume less than 14 percent of economic output in Singapore. Needless to say, there’s nothing in the report to square the circle and justify the claim about the supposed link between higher taxes and economic development. Nothing to explain why Singapore manages to be so rich with such a small burden of government. It’s as if the bureaucrats hoped that nobody would notice that numbers in the study undermined their ideologically driven claim that tax burdens should climb in Asia. Indeed, I wonder if Hong Kong was omitted from the study simply because that would have further undermined the OECD’s preposterous assertion that higher taxes are a route to economic development. P.S. Having low taxes and a modest burden of government certainly is part of what can make a nation rich and successful, but the real goal should be to have a good mix of free markets and small government. Singapore does that, ranking #2 in Economic Freedom of the World. Other Asian nations, by contrast, may have modest fiscal burdens, but the potential economic benefit is undermined by statist policies in areas such as trade, regulation, monetary policy, and property rights. This certainly helps to explain why countries such as Indonesia (#79), Malaysia (#62), and the Philippines (#80) have much lower scores for overall economic liberty. P.P.S. I’m not sure why the OECD would produce such sloppy research. If they simply wanted to create a false narrative, why didn’t the bureaucrats omit Singapore and simply hope nobody knew the numbers from that country (or the historical numbers for North America and Western Europe)? My suspicion is that the senior political types at the OECD wanted to produce a study that would be helpful for certain politicians in the region (i.e., allow them to justify higher tax burdens) and they figured a lot of people would only pay attention to the press release. P.P.P.S. The OECD certainly has a track record of dishonest research. Deceptively manipulating data to make preposterous claims that differing income levels somehow dampen economic growth. Falsely asserting that there is more poverty in the United States than in poor nations such as Greece, Portugal, Turkey, and Hungary. Cherry picking years to create a false narrative about trends in personal income tax revenue and corporate income tax revenue. Peddling dishonest gender wage data, numbers so misleading that they’ve been disavowed by a member of Obama’s Council of Economic Advisers. Deep State is not an American exception. The Berlin Wall was not a DDR exception. Both are expressions of the NWO plan to control the world. Walls are not meant to keep undesirables out but to control those already in. State control of every aspect of life is the ultimate goal of the NWO “elite”. Taxes are the main tool for achieving their globalist target. NWO has infiltrated and taken control of the most critical sectors of economy and mass manipulation middles: banks, the FED, IMF, WB, ECB, radios and newspapers, “social” medias, Hollywood, public education, public health service, influential minority groups (LGBTQRZY, Me-too, Antifa, etc.). And slowly but decidedly they are progressing with their agenda! It is (the last chance) time to open the eyes and start really fighting to take back what is your inalienable right: your FREEDOM! On November 6 vote MAGA and become one of the founders of NWF – The New World Freedom!